In 1936, Bodyke halted the club's first year in the intermediate grade after a replay, however Cratlonian's weren't to wait too long for more honours to follow. The very next year, the club embarked on a purple patch and brought home the County Intermediate Championship in convincing style. In what Cratloe lifelong supporter and native, Frank O Brien recalls as one of the best games of hurling in East Clare for a very long time, the parish booked its first real stamp on Clare Hurling. "That game was spoken about for many years afterwards around the area. Great friends of mine afterwards, namely Mickey Carmody, Dan Cotter and Darcy Neville, often discussed the game with me and they told me there were up to 3,000 people at the game that day. East Clare out of a face using all sorts of transport. Horses, traps and bicycles". "Scariff were the opponents that day, and they'd qualified very easily and were considered hot favourites to win the title. 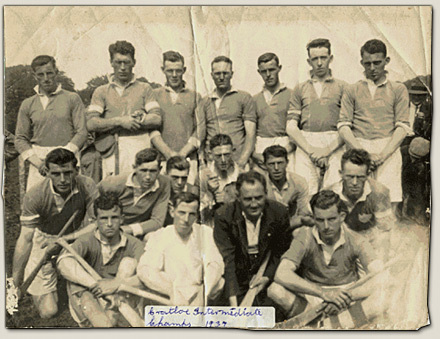 They came o Kilkishen with a strong and experienced team and their trump card Johnny Jones who was at the time playing center field for the county and had won a Senior Championship with Feakle in 1935. To the dismay of Scariff and their large following, Jones was totally eclipsed by Danny Quain, thereby laying the foundation for a spectacular Cratloe victory. That day the three Quain brothers were brilliant. Danny got a knock on the hand early on and caused great worry to the team and it was thought for a time he might have to come off. But no, he played on to the delight of the Cratloe following. P.J Quain got a goal in each half and set up Bill Kennedy for a further goal. Hurling judges leaving Kilkishen that day after the game thought Cratloe would become a major force in Clare Hurling. It's true to say they did but major honours eluded them". Andy Dundass, Jack Trehy, Jack Keyes, John Keane, Mick Quain (Capt. ), Tom Cherry, Tom Considine and Danny Quain, Joe Cherry, P.J Quain, Jimmy Dundass, Stephen Hogan, Mick Kennedy, Bill Kennedy, Michael Shaughnessy, Joe Kennedy, Pat Frost. In 1939, the club qualified for the semi~final of the Senior Championship and were drawn against County Champions, Feakle, but tragedy struck the men in blue and white as they were forced to line out without the services of two of their star players P.J and Danny Quain. Pitted against a team of the caliber of Feakle heading for a two in a row was a daunting task to say the least but to the great surprise of everyone present, Cratloe were considered as very unlucky losers as they were beaten by a silly error in defence in the closing stages. All was not lost however as the Junior B side triumphed and kept Cratloe flags flying that year by lifting the County Championship and beating Whitegate in the final. Pat Frost captained the team. Andy Dundass, Paddy Frost, Jack Flynn, Pat Frost (Capt. ), Tom Quinn, George Frost, Martin Setright, Christy Hickey and Joe Cherry, Jack Hickey, Arthur Brennan, Phil Flynn, Joe Kennedy, Mick McNamara, Stephen Hogan, Michael Coffey, Johnny Ryan, Paddy Gleeson, Brendan Gleeson. Cratloe's era of promise wasn't completed yet however and three years later the Boys in Blue delivered once again under the guidance of local National School-teacher Sean Walsh. Again the core of the team, which set bonfires ablaze and made the breakthrough in 1937 were to the fore coupled with among others, the Frost's of whom, Bob, also represented Clare and the province with notoriety. Cratloe gained the clubs second Intermediate championship, beating Broadford, with arguably the finest side that has worn the blue and white and polished off what was probably the most coveted era in the clubs history. Andy Dundass, Paddy Frost, Jack Keyes, John Keane, Tommy Quinn, George Frost, Martin Setright, Mick Quain (Capt. ), Mick Frost, Tom Clery, P.J Quain. Paddy Brennan, Michael Gleeson, Bill Kennedy, Bob Frost, John Murnane, Tom Lee, Paddy O Brien.